NBA Metrics: The Five Greatest Scorers in NBA History? The Five Greatest Scorers in NBA History? To accurately judge scoring value we need a metric which combines shooting efficiency with volume. 'Points Above Average' is found by taking the players points scored and subtracting their expected points scored (based on their shot attempts). The answer compares a players scoring production with the league as a whole. 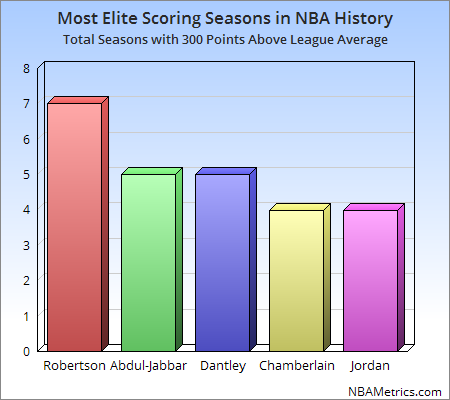 There have been sixty seasons in NBA history where a player garnered 300 Points Above Average. Nearly half of these elite scoring seasons belong to five guys. The graph above shows players who produced the most seasons with 300 Points Above League Average.